Life is full of challenges and adversities, which I know is no secret to you. I would like to share with you, a story of hardship that started when I was a young child, and I have lived with my entire life. In fact, it is a struggle I am dealing with today. It is something I have come to embrace and accept. It's also a challenge and responsibility I have been given to help others who may face isolation, exclusion or loneliness. My hope is that it will inspire you not to give up during the toughest times in your life. To quote St. Paul as he wrote to the Romans – “Let us exult, too, in our hardships, understanding that hardship develops perseverance, and perseverance develops a tested character, something that gives us hope, and a hope which will not let us down, because the love of God has been poured into our hearts by the Holy Spirit which has been given to us." "I would like to share with you, a story of hardship that started when I was a young child, and I have lived with my entire life." From the time I was 8-years-old, I knew I was different. While other girls my age were busy socializing, playing with Barbies, Polly Pockets and reading "American Girl" books, I collected rocks, followed professional hockey, and I loved building forts under an apple tree in my parent’s backyard. I’d sit in solitude during summer months, reading or coloring. I grew up listening to and obsessing over The Beatles. To this day, they’re still my favorite band, and many think that’s odd. I was a good student, and teachers described me as “bright." It wasn’t until 4th grade, that my differences became a concern. Every winter, my father would build an ice rink in our backyard. I’d lace up my figure skates and glide across the ice, lost in a world where I was an Olympian figure skater. Other days, in my hockey skates, I’d practice my stick handling, skating in circles – hockey stick in hand, puck in possession, net in clear view. I daydreamed about playing hockey along with my favorite players in the National Hockey League, just like female goaltender Manon Rhéaume. It was 1992, and "The Mighty Ducks" premiered in theatres. The Buffalo Sabres acquired Dominik Hašek, who would become one of the most unconventional, eccentric and amazing goaltenders of all time. Pat LaFontaine and Alexander Mogilny would become the dynamic duo for the Buffalo Sabres. As I write this, I feel the same sense of joy and wonder I did when I watched my hometown hockey team as a child. I lived in my own world, and while I was kind to others, I couldn’t connect with my peers. Being the “last picked” in gym class, not invited to birthday parties, and not being able to work in groups, my 5th grade teacher expressed concern to my parents, “Nicole is going to have a hard time in middle school. She can’t seem to make any friends”. "Being the “last picked” in gym class, not invited to birthday parties, and not being able to work in groups, my 5th grade teacher expressed concern to my parents, 'Nicole is going to have a hard time in middle school. She can’t seem to make any friends.'" Fast-forward 20 years. “Nicole, you’re different”, my boss told me. The girls in the office had again, gone out to lunch and not invited me. I was in tears. “What do you mean I’m different? How so?” I had grown into a phenomenal long-distance runner, compassionate person, and devoted civil servant. My true dreams of a law enforcement career were crushed only because of a physical disability, but I was a pleasant, kind, successful young woman who had overcome so much adversity. I was a success story! My husband and I had been married for over two years. We attended Mass weekly and enjoyed having conversations about readings and homilies over coffee. I volunteer coached twice a week in a not-for-profit running program, sharing the gift of running, service and being a good person, with middle school girls. Why didn’t my female co-workers like me? What did my boss mean by "different?" “Well, let me clarify,” he explained, “When people perceive a difference, they view it as a weakness. You’re not a weak person at all. I don’t mean that, but… for example, you really seem to know a lot about hockey. That’s not bad, just different for a girl…” I thought for a moment. I supposed it was different, but so what? Why would that make me susceptible to constant social exclusion at work? Or being laughed at for things in life that I took very seriously? (Including my faith). I told my boss if I wasn’t liked here, then I’d go back to school for a master’s degree and move on to something better. He asked me to please not leave. I didn’t. “'When people perceive a difference, they view it as a weakness. You’re not a weak person at all. I don’t mean that, but… for example, you really seem to know a lot about hockey. That’s not bad, just different for a girl…' I thought for a moment. I supposed it was different, but so what?" I brought the negative emotions of loneliness and feeling ostracized by my coworkers home from work almost daily, and unloaded this pain on my husband. For even the most loving spouse, this was so much to handle, and before our third wedding anniversary, we had become a miserable couple. I prayed, every night, that God would keep our marriage from falling apart and for everything to be okay. In the midst of our troubles, a news headline made its way into our household via social media. My husband read to me from his computer, “Susan Boyle has Asperger’s Syndrome. That’s interesting.” After fame from her stint on "Britain’s Got Talent", shocking the world with her social awkwardness combined with her beautiful voice, the announcement of her diagnosis didn’t surprise me. Not long afterward, I decided to read up a little more on the story. I found a news article where Dan Aykroyd (original “Saturday Night Live” cast member, and both writer and actor of the films “The Blues Brothers” and “Ghostbusters”) offered words of encouragement towards Boyle, stating that he too, suffered from Asperger’s syndrome and understood the challenges it brought into life. His wife was the one who told him he needed professional help. “Dan Aykroyd doesn’t have Asperger’s”, I thought. “I know what Asperger’s is, and it’s not him!” To quell my curious mind, I typed into Google: symptoms of Asperger’s. I found myself on a psychology website. I read a description of the symptoms to see how Aykroyd could have this. I found myself reading something I did not at all expect. I was reading a detailed description of a person that sounded very much like me. I showed it to my husband, asking for his thoughts. “I’m not ever one for Internet diagnoses, but this is it. You have Asperger’s." I sought a professional diagnosis, and was officially diagnosed with Asperger’s Syndrome. I was 30 years old. I’ve had a few years to reflect, learn and grow. I’m learning to embrace solitude with grace. I am different. While I may not conform to what society deems as the “model woman”, I know God loves me. He knew me before He created me. He knows me better than I know myself, and has wonderful plans for me, as a married woman, to serve Him, and carry out a vocation of love for others who may be suffering from loneliness or isolation. "I sought a professional diagnosis and was officially diagnosed with Asperger’s Syndrome. I was 30 years old. I’ve had a few years to reflect, learn and grow. I’m learning to embrace solitude with grace." During college and while entering the working world, you’ll meet all kinds of people from different backgrounds – all of whom will have different gifts, talents and abilities than you. At times, you’ll feel alone, or will often be the odd one out. Maybe others won’t have the Christian values you have. What’s key to remember is that God loves everyone you’ll encounter in life – so do not judge – rather, demonstrate Christ's love. If your classmates, co-workers, or neighbors hurt you, take a deep breath and bring your consciousness to Christ. Turn to scripture for advice: “Be vigilant, stay firm in the faith, be brave and strong. Let everything you do be done in love.” (1 Corinthians 16:13-14). Remember, always, you are a beloved daughter of God. "While I may not conform to what society deems as the 'model woman', I know God loves me. ...He knows me better than I know myself, and has wonderful plans for me, as a married woman, to serve Him, and carry out a vocation of love for others who may be suffering from loneliness or isolation." Hi! My name is Nicole, and I live in suburban Buffalo, NY with my husband of nearly 8 years, Nate. We are loving rabbit parents to our one-year-old Holland Lop, Mogilny (yes, we named him after a retired hockey player). I hold a B.A. in Legal Studies from the State University of New York at Buffalo, and presently work doing administrative and technical support work for the Federal Government. I enjoy distance running, volunteering with Life Teen at my church and writing. I am a huge fan of Buffalo's two professional ice hockey teams – The Sabres and The Beauts. For those of us unfamiliar with what Asperger's Syndrome is, would you mind sharing a little bit about it? Asperger's Syndrome is a milder form of Autism, where intelligence is generally above average. Communication and social interaction can be difficult for a person with Asperger's. With this being the case, we can come across as socially awkward, disinterested in others, and sometimes even rude. The truth of the matter (at least in my experience growing up) was that I just never knew what to say to people who weren't interested in the same things as me. People with Asperger's have intense interests they focus on at the exclusion of others. In some cases, this isn't such a great thing. In a personal life example, in 7th grade, I became obsessed with The Beatles. I would feel hurt if someone told me they didn't like The Beatles. At an age where most adolescent girls were trying to fit in, I was busy obsessing and talking exclusively about music that was more popular 30 years earlier. Since I didn't fit the mold of the normal pre-teen girl of the 90's, I was subjected to quite a bit of teasing. Having autism is very different for every person on the spectrum. Some of us cannot tolerate certain scents, textures, lighting or sounds. Others of us are a bit clumsy. I happened to be a natural athlete. We're all different from each other, just like EVERYONE is unique and different. Autistic brains simply process information differently than non-autistic brains. When we only make up about 2% of the world population, self-awareness on our part and acceptance by others is so important. 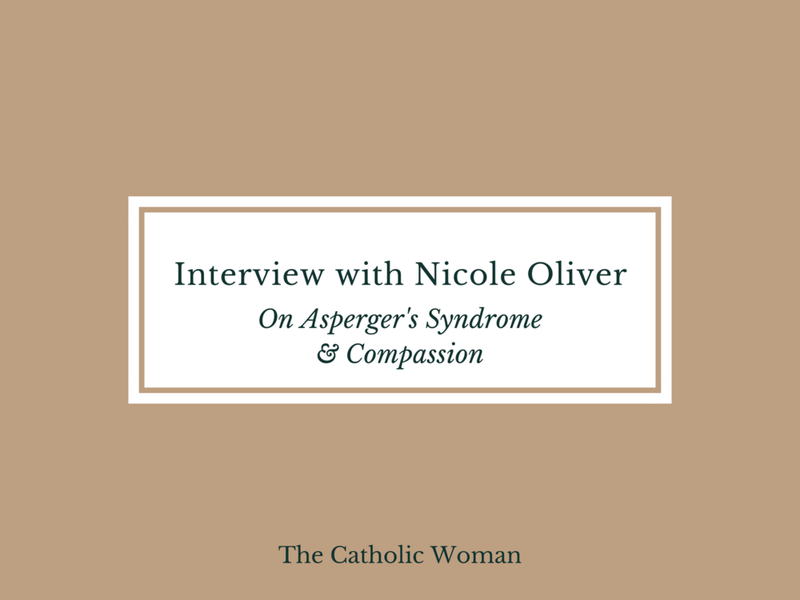 As millennial Catholic women, how can we be more compassionate and welcoming of those in our communities who are on the autistic spectrum? Take some time to learn about autistic spectrum disorder (ASD). Read about people with autism and the things many of them have accomplished – some of them are famous! Many people with autism even have their own blogs and YouTube channels where they discuss their frustrations. You can really learn a lot from someone who experiences ASD first hand and wants to share with people. Last but not least, spend time getting to know people who are autistic. This means initiating conversations with individuals who are painfully shy. It may mean socialization that seems next to impossible, but it's always worth a shot. If someone clearly has an intense topic they're interested in, ask questions about it! The person on the spectrum might really open up, and you might learn something. While they may not understand they should be asking you similar questions, by first gaining trust, they might start taking an interest in you and the things you're interested in as well. To the woman who feels like there isn’t a place in the Church for her — what advice would you lend her? Know that your life has a purpose and there is a place in the Church for you. You have a unique set of gifts and talents that your faith community will value. You do not need to be the best singer, or the funniest comedian, or even the smartest scriptural scholar. Just be yourself and always be kind. If you struggle socially or feel out of place, start small. Hold the church door open for someone on Sunday, smile at them, and say "good morning". Such tiny acts as these are gifts that can and ought to be shared. If you're up for a bit more check to see if your parish has ministries that might be interesting to you. There are so many possibilities – serving the elderly, the young, the sick, the poor, the disabled, becoming a Eucharistic minister, or helping take collections – every church needs people to help, including you! my husband and I listen to music while working on jigsaw puzzles together. training for the Niagara Falls International Marathon (Oct. 14, 2018) in order to raise money and awareness for the Companions in Courage Foundation (running, my favorite hockey player, and children tied into one project!). I'm logging my training journey at Nicole Runs for a Purpose on Facebook.